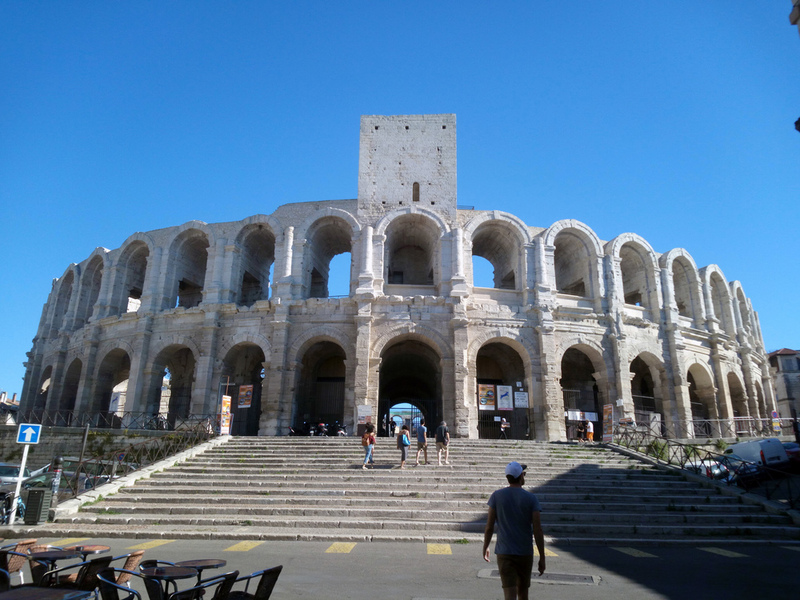 The announcer’s words and the names of the sponsors float out over the ancient arena, split into two halves by the bright glare of the afternoon August sun and the dark territory of shadow that is creeping eastward inch by inch, cast by the high walls. Disregarding this slowly moving frontier, bodies move back and forth over the gritty sand, gouging rubber-soled heels into the ground as they pivot and spraying sand into the air, moving in ever decreasing arcs around their black, horned target. Sweat drips off the foreheads of the runners, and down their necks, soaking the backs of their white shirts. The large oval sandy floor of the arena is contained by a wooden fence, about chest height to a man, painted red many years ago. A low wooden step, about 30cm off the ground runs the length of its inner perimeter. Behind the fence is a second barrier of concrete and metal railings, forming a narrow corridor. Men of various ages stand here, leaning over to hit the wooden barrier with their arms, shouting and yelling advice. Behind them, the crowd, sitting on old wooden benches and rows of sun-warmed stone blocks drinking cold beer out of plastic cups and digging their fingers into small packets of candied peanuts. Every few seconds, 2€ is added to the prize total, until one runner about 18 years old with dark skin and a brown frizzy ponytail held back in an elastic sprints up the bulls left side. Long legged, he flies at the animal and in seconds is within touching distance. Holding a small wood and metal rake in his left hand, he stretches out to snag the prize fixed between the bull’s horns. The bull turns on him, enraged, horns lowered and hooves digging deep into the sand, and chases him with surprising speed. 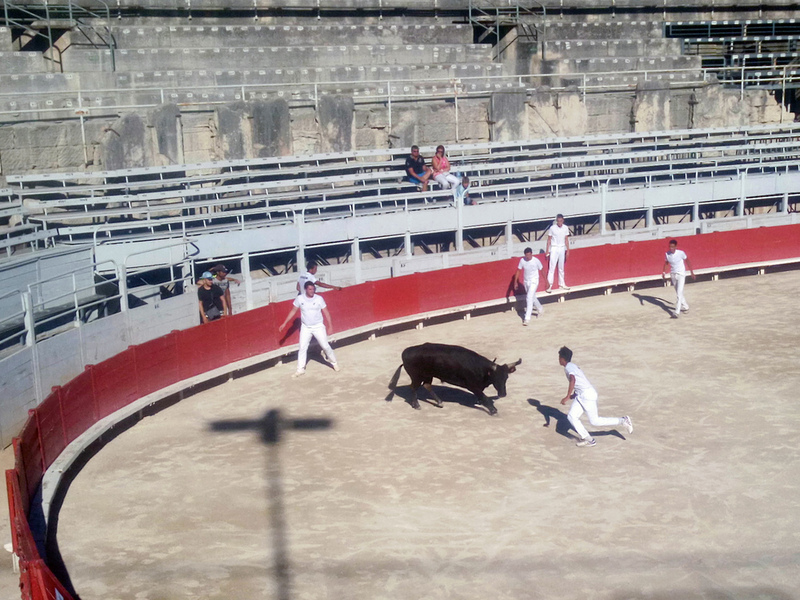 The bull is gaining but just as he should catch his quarry, without slowing down and in one smooth unbroken stride like that of a long-jumper, the runner leaps onto the low step then the top of the fence, throwing himself high into the air. Sailing over the heads of the men standing in the no-man’s land between bull and spectators, he grabs onto the metal railings. Hanging for a second in a half crouch, hands tightly gripping the metal bars he turns back to the arena to see the bull pull up at the last second. It skids to a stop, angrily swatting it’s tail, and pawing the ground. Thwarted. The young runner drops to the sand holding his hand aloft. He’s got the prize. The whole crowd cheers and the Carmen overture blasts over the speakers. 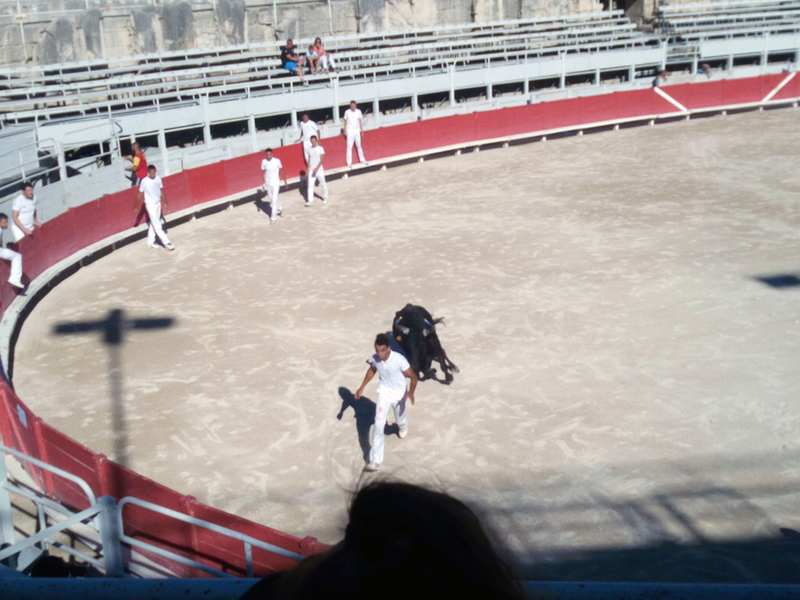 There are about 15 young men in white, swarming over the sand, luring the bull this way and that. Psssst pssst they hiss and the bull swings his huge muscular body around, legs already splayed and hooves gouging as he lurches forward. After the first beat, his head dips down, low to the ground with an unmistakable, primal determination. Every line of his body spells “charge”. The men lure him away from the dangerous open ground in the centre, and towards the ends of arena where it is easier to get to that sweet spot between his horns. Some appear to be novices, and hang back, never using the rakes hanging loosely in their hands. 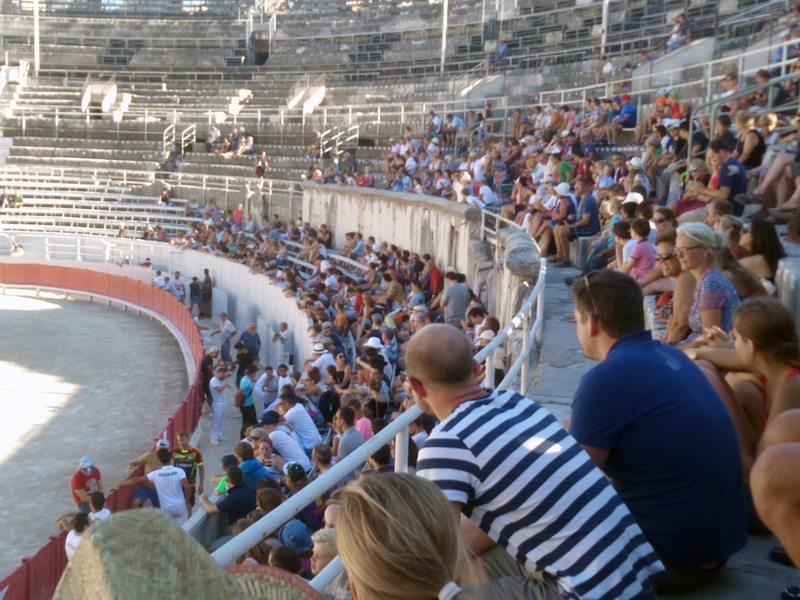 Some straddle the wooden fence, one leg on either side until the bull races towards them, then swing themselves quickly out of harm’s way like white wave breaking over the faded red fence. In their white shirts with their names printed on the back, white trousers and white running shoes with pony tails, undercuts and shaved heads they look halfway between painters and football players, and none seem out of their teens. This bull is especially agitated. When first let into the arena, he spent the full first minute before the runners were allowed into join him, striking the ground with the heel of his front hooves, dragging them back, cutting deep furrows into the ground. His head was lowered and strands of saliva snapped off as he swung this way and that, great hot jets of breath shooting from his nose. He dropped mounds of dung as he spun around, energized, furious, tense. The runners work together. One by one, within seconds of each other they sprint at the black animal, take a swipe and fling themselves of the fence. Thunk, thunk, thunk, thunk as they hit the wooden barrier. Some of them bypass the second step entirely, leaping clean over it, to the metal railing beyond. Occasionally one gets horizontal, arms and legs extended like superman, hanging in the air for a frozen second. None of them ever miss a step. There is a raw grace in their movement, a fluidity that would be pretty if it wasn’t charged with adrenaline and real danger. The bull is literally hot on their heels, it’s pointy horns inches from the soft rubber soles of their shoes. Their coach, a black haired man in shorts and a faded pink T-shirt hurls instructions at them from the sidelines, waving his arms aggressively like a provincial orchestra conductor. A few meters back, an old man watches over the spectacle, his deeply tanned arms dangling over the wooden fence. His shirt is unbuttoned down almost to his stout belly. He peers at the arena from below unruly eyebrows and an ancient flat cap with the air of somebody who has spent long hours there, in the stands, on the sand, running with other young men against other young bulls, then coaching from the sideline, then standing back and offering only the occasional word. The castrated young bull, bred for speed and agility is spun around and around as the men race and sweat and dart this way and that. Muscular but lean, there is something catlike and graceful in his movement. Becoming more and more frustrated, he chases a runner right up to the barrier and again, at the last moment is denied his revenge as the white body leaps easily out of harm's way. Enraged he drags his horns back and forth against the fence, rattling loose wooden planks. The next time a runner gets close he gives chase and instead of skidding to a stop as usual, follows him over the fence in his own incredible, if ungainly leap. Front legs over, his back legs scramble for purchase then propel him clean over. The crowd leaps to its feet with an “Ooooh!” and the runners scramble to safety. 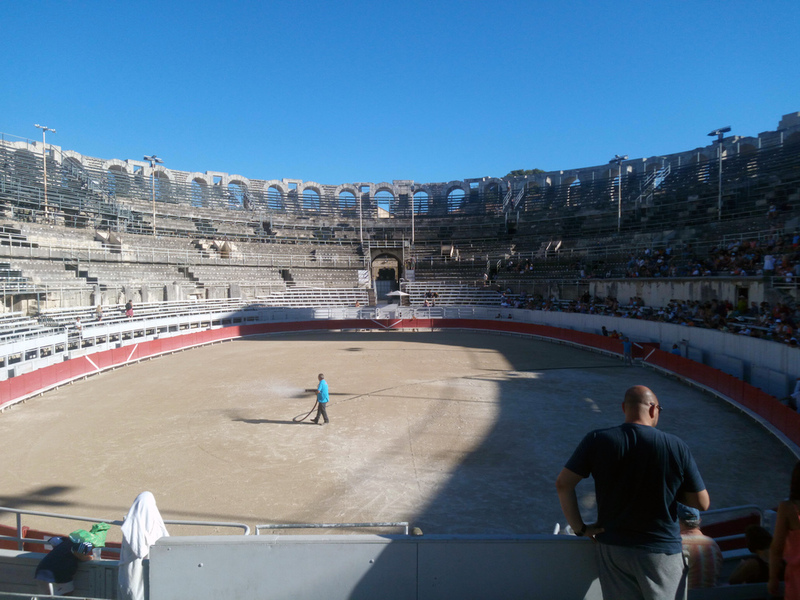 All the men in the inner circle either leap over the fence into the arena, or dart behind small walls dotted here and there, into spaces too narrow for the head or shoulders of a bull. The animal cannot find his way out, until a man strips off his shirt and dangles it in front of his nose, shouting and slapping the wooden fence with his arms as he runs. More join in, and as always, just as it seems soft flesh and sharp horn will finally meet, part of the fence swings open and the bull charges back onto the sand. The race continues, though runner and bull alike are tiring. The bull turns more slowly now, and sometimes doesn’t give chase at all, staring at the white bodies who occasionally come to a complete halt before him. The sun has crept further and further west and now only a thin sliver of light falls directly onto the arena. The sandy floor is covered in morse code, dots drawn by spinning hoof and heel, dashes of racing and skidding feet. The marks write a story of combat, agility, will and daring. Finally the announcer falls silent, and all the runners but one drop back to the wooden fence, panting and spent. 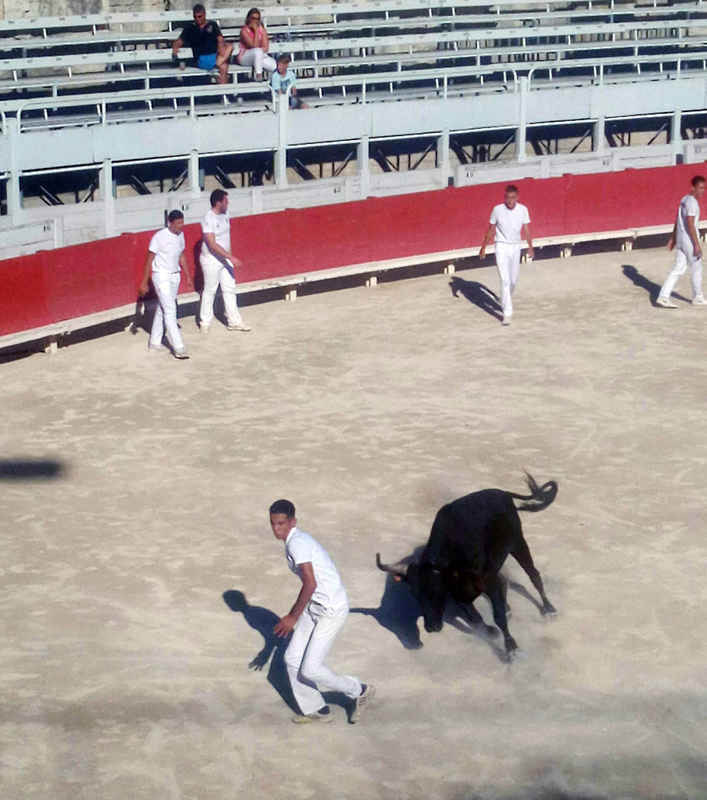 The white shirted man runs at the bull, but instead of reaching for his prize, he peels off, quickly replaced by another runner, then another. They lead the bull to the top of the arena, and just as he is seems about to leap over the fence, it swings open, revealing the dark and cool corridor. Tail swishing, he trots away from the sunlight and cheers echoing around the arena. Pssst... I've lived in France for 7 years, and it has become my second home. Click here to read more of my travel and adventure writing from this beautiful country.